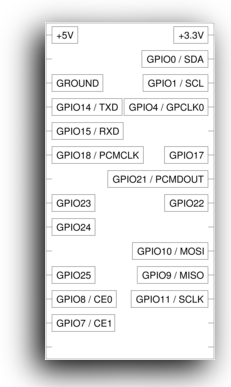 If you want to connect fun hardware to the Raspberry Pi, then the chances are that you'll be using the GPIO port.1 This is a 26-way DIL header, much like the printer port on the BBC Micro. Purists might have prefered a 20-pin connector to match the User Port, but no matter. Even though decades have elapsed since those days, the best way to connect to the header is still probably an IDC connector. You simply take one of these and clamp it on the end of a piece of ribbon cable with a vice.2 No fiddly wires to strip, no solder required. Of course it's all very well to connect the cable to the Raspberry Pi. but it's not much use if the other end is just flapping in the breeze. 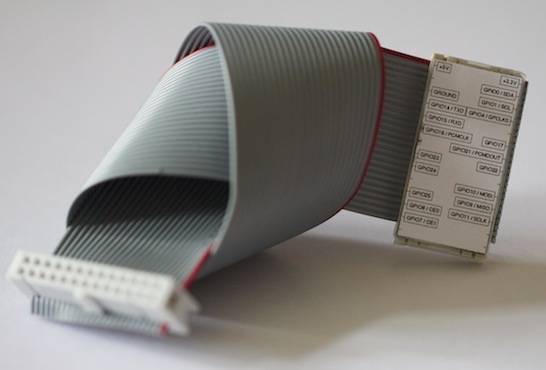 On could simply use another IDC header, and that would be quite sensible if you were connecting the Pi to another PCB. However, if you'd like to connect to some components on breadboard or stripboard, the 0.1" gap between the rows of connectors is a nuisance. Happily there's a better alternative: use an IDC DIP header. I couldn't find any 26-way versions, but Farnell will sell you a 28-pin header3 from Harting for about £3.50 ($5.50) plus VAT. Doubtless there are other sources. It's easy to plug this into a breadboard, or a suitable IC socket. The main disadvantage is that the connector is physically quite large. Another potential issue if that the exposed pins carry the Raspberry Pi's supply rails, and shorting them out is bad. So don't do that! In one respect though, a large connector is an advantage: we can easily label the pins. If you want to make of these for yourself, download the tarball4 and print the PDF file. If you want to make changes, feel free to edit the noddy PostScript file, and then print that. In the best Blue Peter tradition, cut out the label, then stick it to the header with double-sided sticky table or super-glue. Revised by Martin Oldfield on 05 Jun 2013, original version 30 Jul 2012.